IS THERE SUCH A THING AS A BROKEN HEART? A young woman has spoken of the horror of suffering acne so severe she felt like a 'monster'. Keeve Angline, 27, from Dublin, felt so unattractive she was too terrified to speak to men, let alone go on a date. The only time ever she plucked up the courage to talk to a man, he mistakenly asked if she had been in an accident, leaving her in tears. 'The night before, in a fit of anger that my acne would not go no matter what I did, I had scrubbed my face viciously with one of those cleansing mitts ,' she told MailOnline. For years, she tried different medications and antibiotics, which left her skin dry, flaky and sensitive to sunburn. Desperately unhappy, once she tried to scrub off her acne with a wire exfoliating mitt and ended up removing half the skin on the side of her face. She had also tried traditional methods of clearing her skin, such as going on the Pill, or taking antibiotics. But, despite years of medication, nothing had worked. The antibiotics left her feeling ill and one of the topical treatments, benzoyle peroxide left her skin hypersensitive to sunlight. After reaching the point of despair, her mother saw an advert for silver serum, a cream containing the anti-bacterial agent anti-microbial silver. Dubious at first, within a few months of applying the cream her skin had cleared, and she is now confident enough to go to the pub with friends – some of whom are male – after work. While she still feels nervous around men, she now feels confident enough to approach and talk to them, and hopes to find love. Miss Angline, who works as a make-up artist, told MailOnline: 'Since becoming an adult I have never had a relationship. 'The problem was when I began working my acne got even worse. It was probably the stress but by the time I was 24 my acne was horrific. 'As a result, my confidence about dating men completely disappeared. 'I became too insecure to even get beyond that initial conversation with a man. 'I found it too painful to try and start the whole process of going on a date, I was too worried that he'd be looking at my skin. Her friends would point out men who were approaching, but she would stare at the ground, too nervous to talk to them. 'I always thought to myself that there were so many beautiful women around with perfect skin, why would any guy ever want to talk to me?' she said. And the few experiences she had of trying to talk to men did not go well. 'Earlier this year I plucked up the courage to try and get chatting to a guy at work. 'We chatted for about ten minutes and it was going well and then he asked me if I had been in an accident as he said my face was all swollen and raw on one side. It wasn't only her love life that was affected by her skin. She couldn't go to the gym during normal hours for fear of her make up running off. She went at strange times like 2am in the morning so there was no-one there to see her bare face. Last summer she was going to a festival with friends where they planned on camping for three days. Before they left, her friends excitedly mentioned they knew some guys who they might be meeting to camp with. But this caused Miss Angline to panic. 'As soon as they mentioned this, I freaked out,' she said. 'The thought of guys seeing me without make up scared me so much that I ended up forking out and stayed in a hotel. Another time, she even cancelled a holiday to Berlin that she had already paid for. 'My skin was so bad I just couldn't face the trip,' she said. If she went on holiday with friends, she would sit under a blanked for fear of getting burnt. 'One time on St Patricks Day in 2012 I went out in the sun for half an hour and when I got home my skin was blistered due to the sun burn,' she recalls. 'Even water burned my face it was so sensitive and sore. Now her skin is clear, Miss Angline has tried surfing, something she always wanted to do but couldn't before as the sea would have washed away her make up. Wearing make-up was agony, as her skin was so sensitive, but she didn't feel confident enough to leave the house without it, waking up two hours early every day to slather it on. 'I simply learnt to bear the pain,' she said. The crunch point came when her dermatologist suggested she tried RoAccutane, a treatment for severe acne that is highly effective but has been linked with a number of side-effects, including mental health issues. She said: 'I had been prescribed so many pills and drugs over the years that this was the final straw. 'I knew the effects of RoAccutane and I was shocked that I was being recommended to take it, especially as my self-esteem was already very low. However, as soon as she stopped taking the medication her skin broke out in the worst acne flare up she had ever experienced. She took a holiday from work, stopped putting products oN her skin and stayed in her house researching acne on the internet. For a week, she didn't see friends or leave the house. 'I was in complete despair and I didn't know how I was going to face the world,' she said. Just as she began to wonder how she would cope, her mother called and said she'd seen an article on a product called Silver Serum. Silver Serum contains anti-microbial silver, an anti-bacterial agent used in the NHS in medical dressings to treat infected skin ulcers. Its manufacturers claim it works on acne by destroying bad skin bacteria that causes acne - while crucially preserving good skin bacteria that helps keep skin strong and fights infection. Worried about her daughter, Miss Angline's mother had already ordered it and it arrived the next day. She claims her skin felt calmer initially, and the product didn't sting her skin as others did. After a month of using the product, her spots began to clear. She said: 'The deep cysts that never cleared up started receding. 'I was able to return to work after a week and face people as my skin had improved enough for me to feel just about confident enough to leave the house. 'I was also able to wear makeup without it stinging if I put the Silver Serum on first. 'Within two months my skin was completely clear. She says her skin becoming clear has changed her life. She said: 'I can now go to the gym in normal hours, instead of at weird early hours of the morning. 'I don't have to wake up two hours in advance to make up my face and coach myself to pluck up the courage to leave for work in the morning. While she is still single, she doesn't feel like a monster anymore, and is building up her confidence, hoping to start dating and eventually have a boyfriend. She said: 'I now actually go to pub on a Friday night with friends (some of them men) from work. I would never have done that six months ago. 'I now speak to guys and I've even managed to flirt a bit. 'Its early days but I feel confident that I'll meet someone soon. WHAT IS ANTI-MICROBIAL SILVER AND HOW DOES IT HELP ACNE? 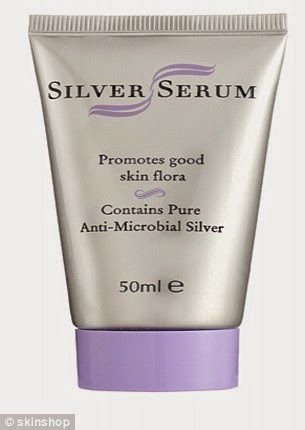 Silver Serum contains anti-microbial silver, a well known anti-bacterial agent. Silver is used in by the NHS in some medical dressing for treating infected skin ulcers. It is also used by NASA for keeping water supplies for crew members free from bacteria while in space. Manufacturers claim Silver Serum works on acne by destroying ‘bad’ acne-causing bacteria. However it also preserves ‘good’ skin bacteria that helps keep skin strong and fights infection, they say. Normal anti-bacterial agents for acne penetrate all levels of the epidermis killing all skin bacteria, both good and bad. This is much in the same way that antibiotics kill all bacteria in the body, both good and bad. This leaves the skin stripped of all protection and makes it much more vulnerable to future infections, according to Silver Serum's manufacturers. It is claimed the anti-microbial silver in the product kills the ‘bad’ bacteria that enters the skin via the open skin pore immediately. The the good skin bacteria breeding at the base of the hair shaft remains intact and multiplies, making the skin stronger and better prepared to fight off infection on the next acne outbreak, they say. For more information visit the Skin Shop website. The answer; yes indeed there is. A broken heart causes real pain, not just mental and emotional pain but it manifests in physical pain too as the article from the Daily Mail below explains. We are holistic beings our spirit, our emotions and our physical well being are intertwined. Believe me I understand I've been there the pain isn't just like a physical pain for I wish it was as that is easier to deal with and most people understand and can sympathise with physical pain not everyone understands nor sympathises with emotional pain as I'm sure those of you who have felt this know. Because we are holistic beings emotional pain if not dealt with can manifest in physical ailments. I have written many times on this site how stress manifests in physical ailments. I have a well tested exercise (below the Daily Mail article) that will help heal a broken heart but the pain won't disappear overnight but practising this exercise regularly will help you cope and lessen the pain, it really does help. You won't forget the memories and pain, I'd be lying if I said you will, but you'll realise life goes on and life is worth living and your broken heart will heal albeit it may have a scar. All life's experiences teach us something and serve a purpose, those experiences teach us understanding, empathy and compassion so those of you who have been there can in turn help others hearts heal. There will come a time when your heart will laugh again. You feel miserable, you don't eat and you can't sleep. But a break up also affects the body in other ways. Doctors agree the stress hormones released after a split wreak havoc on the body and damage health. They say love is a drug, and it turns out people do suffer withdrawal symptoms from their partner after splitting up, similar to the cravings drug addicts experience for cocaine. The anguish experienced during a split activates the same part of the brain that is stimulated during addiction, according a Stony Brook University. Analysing brain scans of the broken-hearted, they found similarities between romantic rejection and cocaine craving. After a break up, people are at risk of suffering depression and anxiety, conditions which can bring on insomnia, and are also in turn made worse by a lack of sleep. Psychologist Dr Susan Quilliam says the anguish of a break up brings back deep-seated memories about being abandoned as a child that everyone holds – even without knowing it. She told MailOnline: ‘Human babies cannot survive on their own. They might die of lack of warmth or food. ‘A human is programmed to need human contact, and to be affected when human contact is withdrawn. ‘But at some point everyone in childhood thinks "oh my god I’m alone I’m going to die". People go through a similar bereavement process during a break up as when someone has died, she added. ‘They go through the bereavement cycle, typically shock, denial, grief, anger, blame, self-blame helplessness, fear of the future, depression and then acceptance,' she told MailOnline. ‘If people feel abandoned but don’t feel anger, they come depressed, they lose confidence in their ability to have a relationship in the future. Remembering the reasons for the break-up, and trying to remember why it is a good idea can help prevent sinking into depression, she said. ‘Particularly if a break up is wise, and you know it happened for a reason, you can come out a lot wiser. It can leave people stronger. And remembering an old Japanese saying is particularly helpful, she said. Just as a person can be more beautiful if they have suffered a break up and have had to put themselves back together again, she added. Intense emotional pain can activate the same networks of nerves as physical pain, according to Colombia University psychologists. So being rejected or grieving over a lost love can actually really hurt, and feel a bit like being punched. Researcher Edward Smith took MRI scans of participants’ brains and then asked them to look at pictures of old flames. He found an overlap between the pathways for emotional and physical pain. Rejection stimulated the same nerve signals that cause pain when a person spills tea on themselves or stubs their toe, he said. After a break up or a divorce, the body is flooded with stress hormones cortisol and adrenaline. This leads to the heart beating faster and triggers abnormal heart rhythms. Dr Graham Jackson, a retired cardiologist and now chairman of the Sexual Advice Association said he often saw people dying of a heart attack within the first fortnight after a break up. ‘People start worrying, the adrenaline levels go up, the body goes into "fight or flight mode" and the stress can cause sudden heart attack and death. ‘They go pale, the heart starts beating too fast. When it does that, you have a narrowing in the arteries which is not normally significant, but it comes significant, when stressed. ‘Even if you don’t have a heart attack this can cause irregular heartbeat and rapid heart beat. Women tend to die suddenly in the short term after a break up, but more men die of heart attacks in the long run. Dr Jackson said men whose lives leave them tend to fare badly, he said. ‘They don’t look after themselves, they don’t eat well, they don’t exercise, they don’t go to the doctor. So they die,’ he explained. The stress hormones released after a break up can aggravate the skin. Dr Daron Seukerman, a consultant dermatologist at SK:N clinic, Harley street, London, told MailOnline: ‘A break up is naturally one of the biggest things that can happen in a person’s life, comparable to bereavement. ‘A cocktail of stress hormones flood the body and can damage health in all sorts of ways. He said a mixture of studies and anecdotal evidence shows stress and depression is linked with a deterioration of psoriasis, eczema, alopecia and even acne. Not only do stress hormones trigger changes in skin, people might become distracted after a break up and let their treatment regime slide. ‘One of the things that can happen is patients might have a daily regiment of treatment for their skin problem- moisturisers and so on,’ he said. However, he did have some good news for those prone to comfort eat after the loss of romance. ‘There’s no evidence eating more chocolate would give you more acne,’ he said. People who have gone through a divorce are 23 per cent more likely to suffer from mobility issues such as difficulty climbing stairs or walking short distances, according to a University of Texas study. Sammy Margo, a chartered physiotherapist said people come in with a painful area of the body, and it turns out that they haven’t been in an accident, but have experienced their relationship break down. She told MailOnline: ‘We don’t treat people for overdoing it or lifting heavy weights. We now treat people for sitting at desks for long hours, and stress. ‘If I talk to someone with a neck problem, usually they haven’t done anything mechanical to set the problem off. ‘But it comes up in conversation that they’ve had a break up or a divorce. The stress causes muscle spasms and tightness. ‘If this happens over the part of a body that is already weak, muscles shorten, tighten and this causes pain. People who are stressed are also more vulnerable to injury. ‘You’re more likely to crash your car or trip up,’ she added. People are often too lovesick to eat in the first few weeks after a break up. This is because when stressed, a part of the brain called the hypothalamus produces a hormone which suppresses appetite, according to Harvard Medical School scientists. The brain also sends messages to adrenal glands on the kidneys to pump out adrenaline, which triggers the body’s fight or flight response, which puts eating on hold. But in the long term, Yale scientists discovered stress causes weight gain, especially around the middle. It makes the cells less sensitive to the hormone insulin, and so the body produces more insulin in response. But insulin turns sugar into fat, increasing the rate at which fat is stored in the body and leading to weight gain. It also causes the body to crave sugar and fat, which leads to mindless eating. Stressed people also lose sleep, do less exercise, and drink more alcohol, all of which can lead to them piling on the pounds. Stress also diverts blood away from the digestive system, which can lead to stomach pain, diarrhoea and constipation. Scientists have discovered that we shed different 'types' of tears. Basal tears are released to keep the eyes moist, and reflex tears are released in response to irritants, such as when a person chops onions. Tears associated with emotional crying are called 'psychic' tears and are produced by the lachrymal gland, located in the upper corner of the eyelids. They are more watery and less salty than 'basal' and 'reflex' tears. Emotional tears overflow, spill down the cheeks (often leaving trails of mascara) and drain through tiny ducts in the back of the nose. So because of the process of osmosis, the water moves into the saltier tissues of the eyes, which makes them swell up and look puffy. Lots of rubbing with tissues can also make them red and sore. Visualise you are standing opposite the one you wish to cut ties with and visualise a ribbon of each associated colour with each chakra for example red for base, orange for sacral, yellow for solar plexus, green or pink for the heart, blue for throat, indigo for third eye and purple for crown. These coloured ribbons join each of you together.